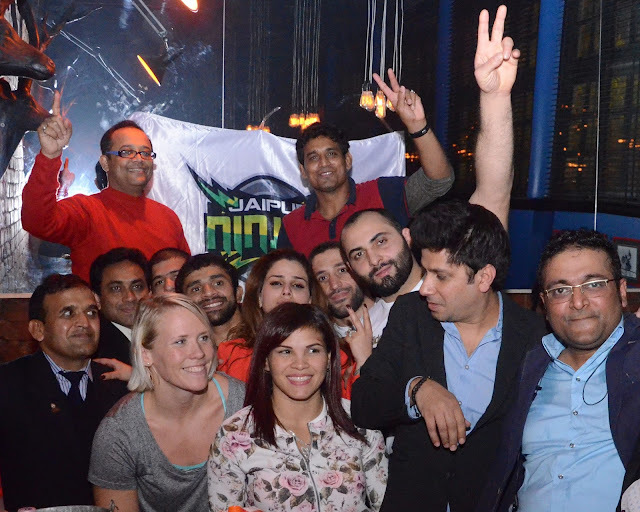 Jaipur Ninjas are the new entrant in Season II of PWL and been playing so well. The team with Fauladi Josh has given tough time to the opponents and has placed themselves into the semi-final. The team was seen enjoying the snacks, chatting and also danced to some of the desi & international numbers being played by the in-house DJ. Spotted at the do were Ram Gupta, Kashish Singh, Jayant Jain, team captain Elizbar Odikadze, Jakob Makarashvili, Jenny Fransson, Betzabeth Arguello, Pooja Dhanda, Rahul Mann, Vinod Kumar, Coach Mahavir & Jeetendra, officials from WFI and close friend of the franchise owners. "We are playing with enthusiasm and been able to outplay the opponents; this is for our team to lift their spirit and motivate to do well in rest of the matches to come out as Champions", says Ram Gupta, Co-owner Jaipur Ninjas. "I'm happy with the way we have performed so far. The matches have been a close contest and our players kept their nerves to win the bouts & matches. The Girl power in Jenny, Pooja, Betzabeth & Ritu played superbly and hopefully we'll be able to grab the title as well", Kashish Singh said. Being an excited & enthusiast owner, Kashish concluded saying "Hum Hain Jaipur Ninjas, Hum Me Hai Fauladi Josh! Aur Hum Karenge Sabko Dher!"